If you happened to be in Hiroshima Japan 67 years ago, at 10:34am on August 6,1945, it was to be the start of a dark day. 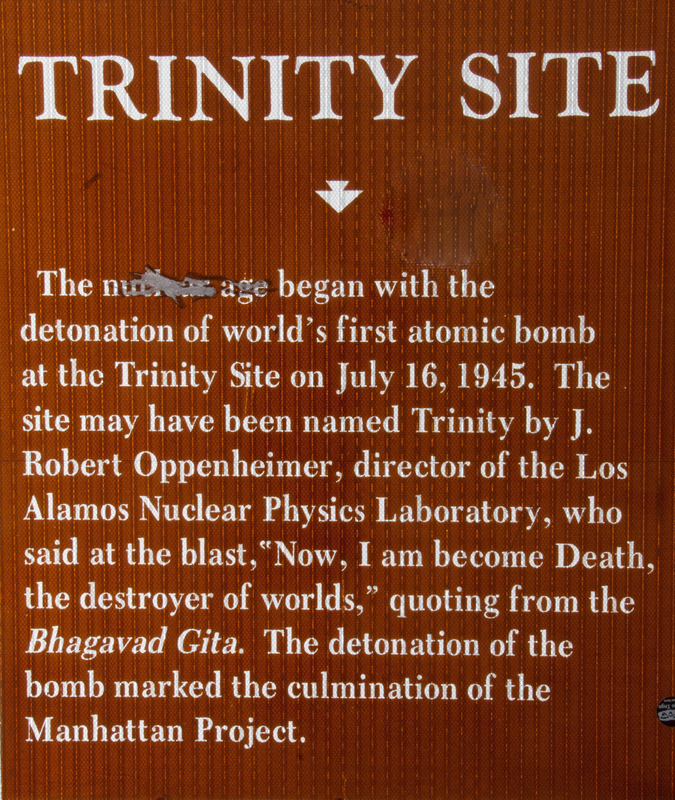 The mission on Hiroshima began at 8:16 a.m. The time of actual destruction and impact was 10:34am according to a clock in the Hiroshima Peace Museum on display. This antique wind-up pendulum 31 day clock survived the blast half intact. That converts to 8:16pm – 10:34 pm today, Sunday, August 5 here in Alpine,Tx. 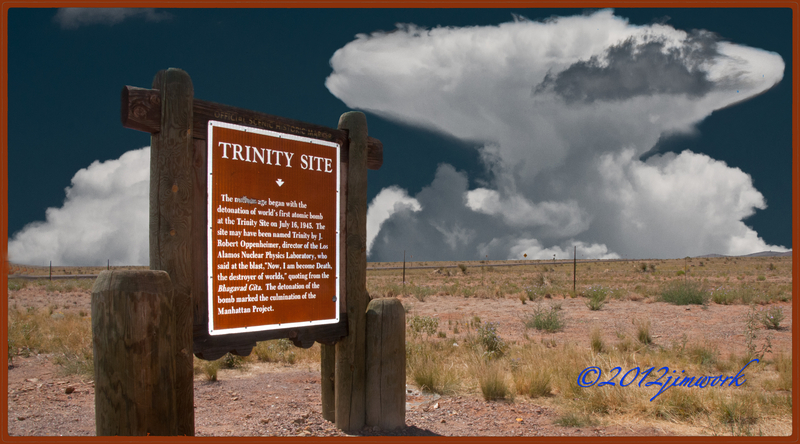 Earlier this summer, we came by the highway marker on US 380 near the Trinity Site in New Mexico. Back in the 80’s, I was working in the defense industry and had the opportunity(?) to visit the Obelisk at ground zero. I even picked up a few pieces of trinitite (sand/earth that was converted into glass from the heat of the blast) that I kept for years in my desk at work. I finally threw them away when I left defense work. I somehow believed that they truly had bad karma with them. I now have mixed feelings about our use of “the gadget”. I have read all the stats about how many lives were saved by our 2 detonations. I would hate to have been the one to sell that to the Japanese people. According to wikipeda: Within the first two to four months of the bombings, the acute effects killed 90,000–166,000 people in Hiroshima and 60,000–80,000 in Nagasaki, with roughly half of the deaths in each city occurring on the first day. The Hiroshima prefecture health department estimated that, of the people who died on the day of the explosion, 60% died from flash or flame burns, 30% from falling debris and 10% from other causes. During the following months, large numbers died from the effect of burns, radiation sickness, and other injuries, compounded by illness. In a US estimate of the total immediate and short term cause of death, 15–20% died from radiation sickness, 20–30% from burns, and 50–60% from other injuries, compounded by illness. In both cities, most of the dead were civilians, although Hiroshima had a sizable garrison. My father was a WWII veteran and served the course of the war in the Pacific as a Navy/Marine combat photographer. My mother carried bitterness and extreme prejudices towards the Japanese. I grew up doing “duck & cover” drills in elementary school. Somewhere in between all that, I have just grown to despise the thought of so many souls being vaporized. So shoot me. The “day of infamy” that started it all ended exactly the same way.